A new interactive resource from the Kaiser Family Foundation synthesizes the most up-to-date evidence on Medicare’s efforts to reduce the growth in health care spending and improve patient care through new payment and delivery reform models. KFF’s Evidence Link is a central source of information and data about Medicare accountable care organizations (ACOs), medical home models, and bundled payment models—all developed by the Centers for Medicare and Medicaid Services (CMS) under the Affordable Care Act (ACA). New findings, released by CMS over the past few weeks, show mixed and modest gains in Medicare savings for ACOs in 2016—currently accounting for care provided to over 11 million Medicare beneficiaries (almost 20 percent of the Medicare population). 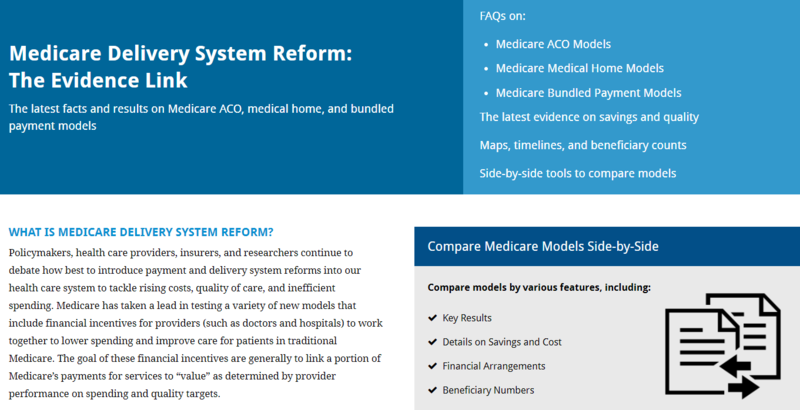 The Evidence Link provides current information on these Medicare models, including basic descriptions, maps with model location, timelines, and the number of beneficiaries and health care providers associated with the various models. It includes answers to frequently asked questions (FAQs) and provides summary and in-depth results pertaining to Medicare savings and quality. Users can dig deeper with a side-by-side comparison of each model to examine specific features, such as financial incentives, patient involvement, and details on cost and quality outcomes. The Evidence Link will be updated frequently to reflect new savings and quality results on Medicare ACOs, medical homes, bundled payments and other models. It will also be a source for related news and announcements, such as the request for information (RFI) released by the Center for Medicare and Medicaid Innovations (CMMI) and the announcement of the forthcoming expansion of the Medicare Diabetes Prevention Program Model. KFF also has created a video tutorial explaining how to use the new interactive tool and highlighting the kinds of information that users may find on it. KFF will host a web briefing Nov. 28 that will examine the future of delivery system reform in Medicare. Register here for more details.